Image | November 14, 2018 November 15, 2018 | Polar Focus, Inc.
National Arts Center in Ontario. and Zbeam halves to support this gorgeous installation. Video | July 10, 2018 November 15, 2018 | Polar Focus, Inc.
hardware designed for this amazing new Community product. Mike and James had a great time talking to everyone and hearing about upcoming projects. November 2, 2017 | Polar Focus, Inc. This image is the output of our Finite Element Analysis package being used to confirm the WLL (Working Load Limit) of our popular PM1-17-G Pole Mount. We’re doing this rigorous analysis as part of a project with our friends at Community Professional Loudspeakers. 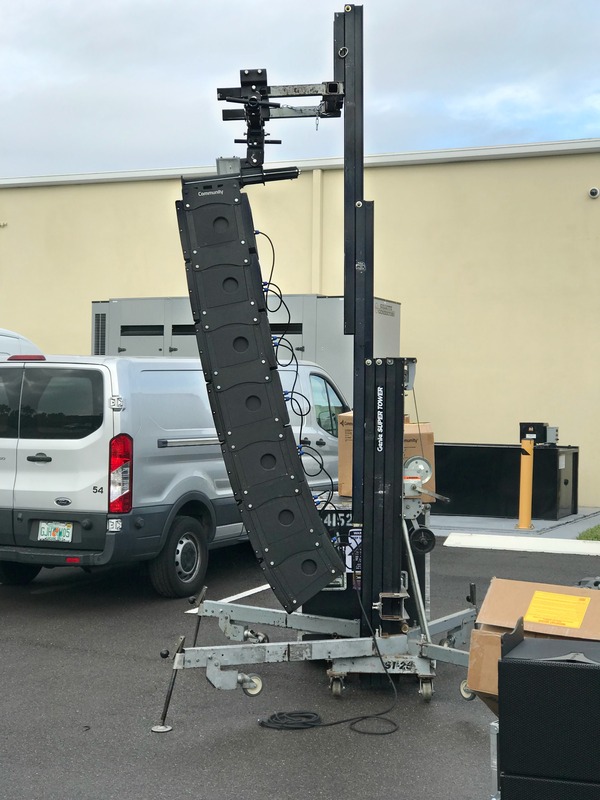 We’re developing a way to extend their new IV6 line array product as a pole mounted line array for top performance and easy installation. 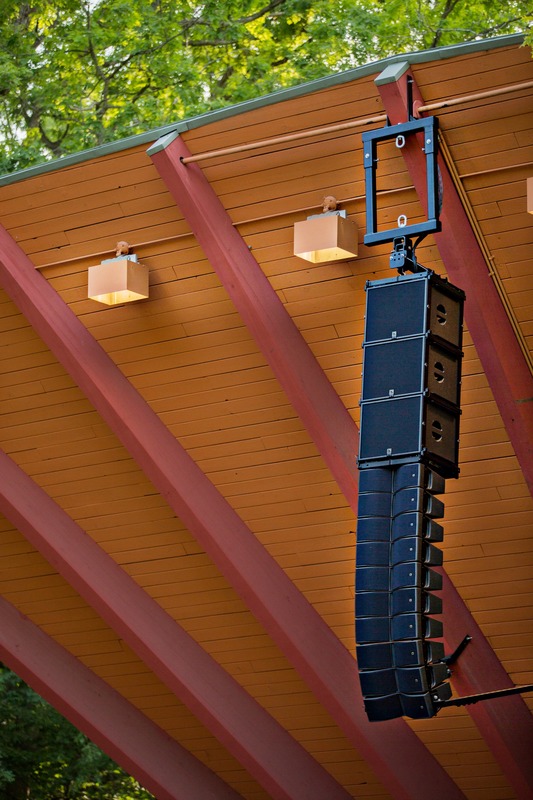 We’re really looking forward to watching this line array become a popular outdoor sound system. 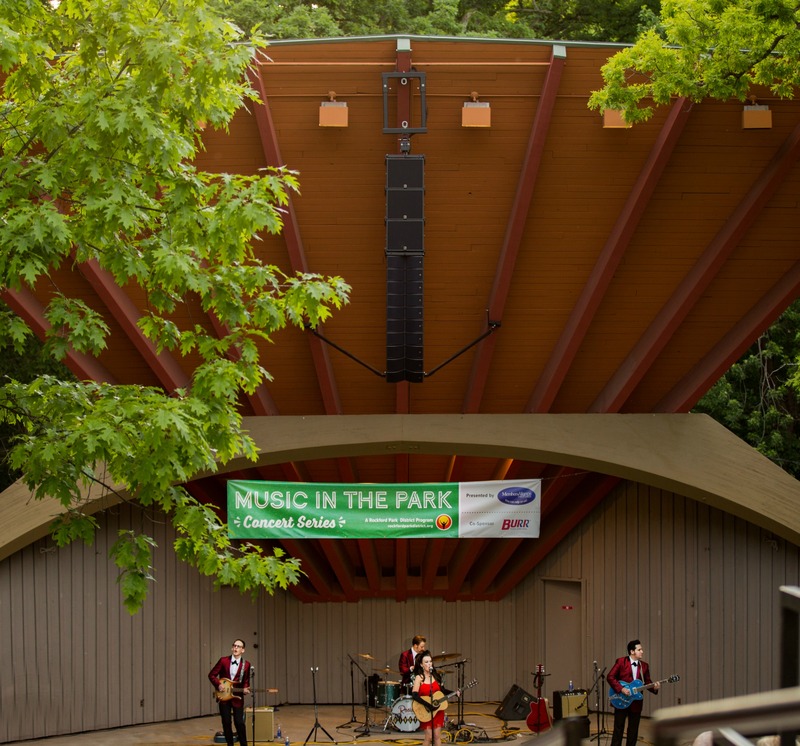 Image | July 19, 2017 | Polar Focus, Inc.
Mik Moore of Clearwing Productions contacted us for this challenging line array installation rigging used at the Sinnissippi Music Shell in Rockford, IL. 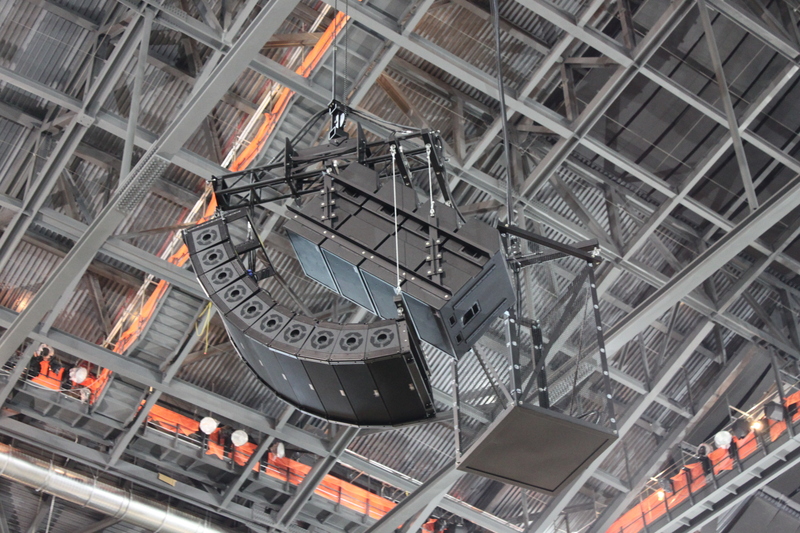 The speakers were 3 L-Acoustics SB15m subwoofers, along with 10 KIVA II mid-hi boxes as a center cluster. The cluster needed to be weather rated as it is left installed from late spring through early autumn. The square frame at the top allows for an installation hoist to lift the cluster into position; after set up the hoist can be removed. At the end of the performance season, the procedure is reversed. Braces from the bottom of the cluster to left and right wood beams lock off the cluster and keep it from swinging in the wind. This is a beautiful facility with a great sounding system. Great job by Mik and his team! 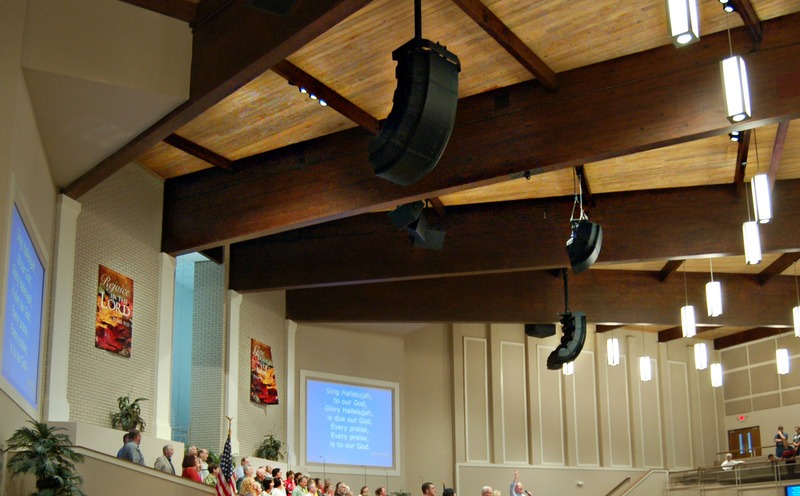 Image | January 10, 2017 July 11, 2018 | Polar Focus, Inc.
Southland Baptist Temple contacted Mark Lowrance of Lowrance Sound Company, Inc. of Union City, Tennessee to upgrade their sound system. 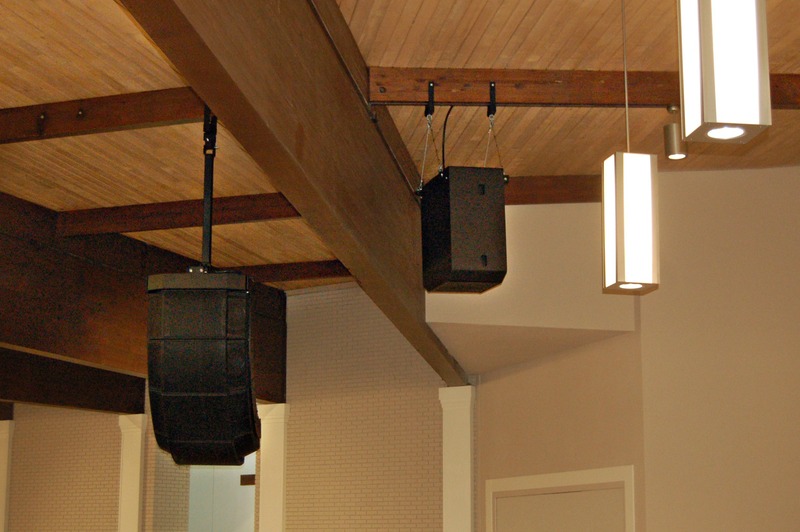 Mark utilized a design with Bose Professional RoomMatch line array modules in a left and right configuration, along with a downfiring RMS-123 model subwoofer on each side. 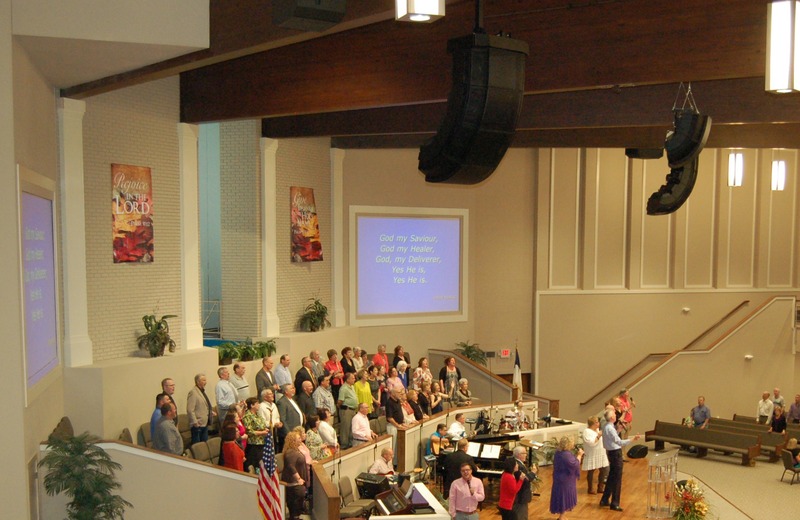 Additional speakers from Bose were used as choir fills. Mark chose Polar Focus for our family of wood beam brackets for super clean installation. Polar Focus also offered an aftermarket line array frame for the Bose RoomMatch with integral tilt control and a full range of accessories. Using a Custom Beam Attachment to connect to the wood beams with a structural extension post that was also a cable raceway resulted in a very clean and safe installation. This system looks great and sounds better! 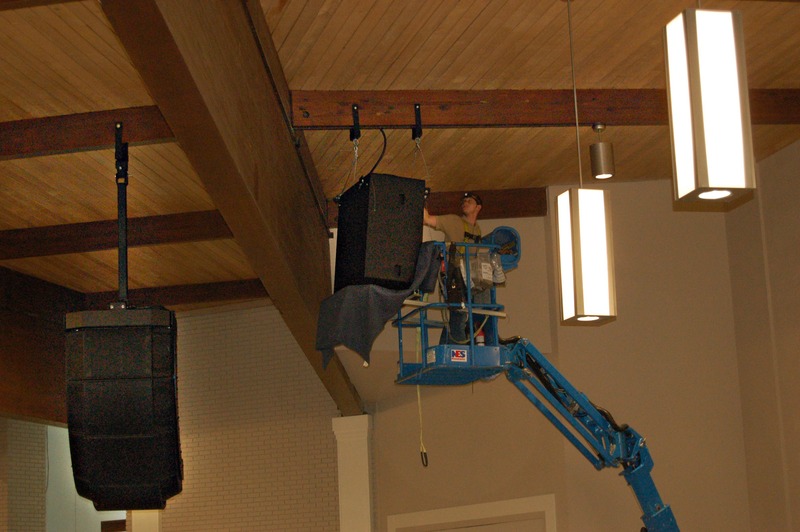 The team at Lowrance Sound specializes in high quality sound systems installed well. Image | December 21, 2016 April 3, 2019 | Polar Focus, Inc. The crank-lift mounting bracket holds up to 800 lbs. It is custom fabricated based on comparing tower manufacturer specs with the measurement of actual fork-play in the client’s own lift towers of the same model. Image | August 18, 2016 August 23, 2016 | Polar Focus, Inc. This 18″ diameter pulley configuration is one of four we recently made for the Thomas & Mack Center at UNLV. 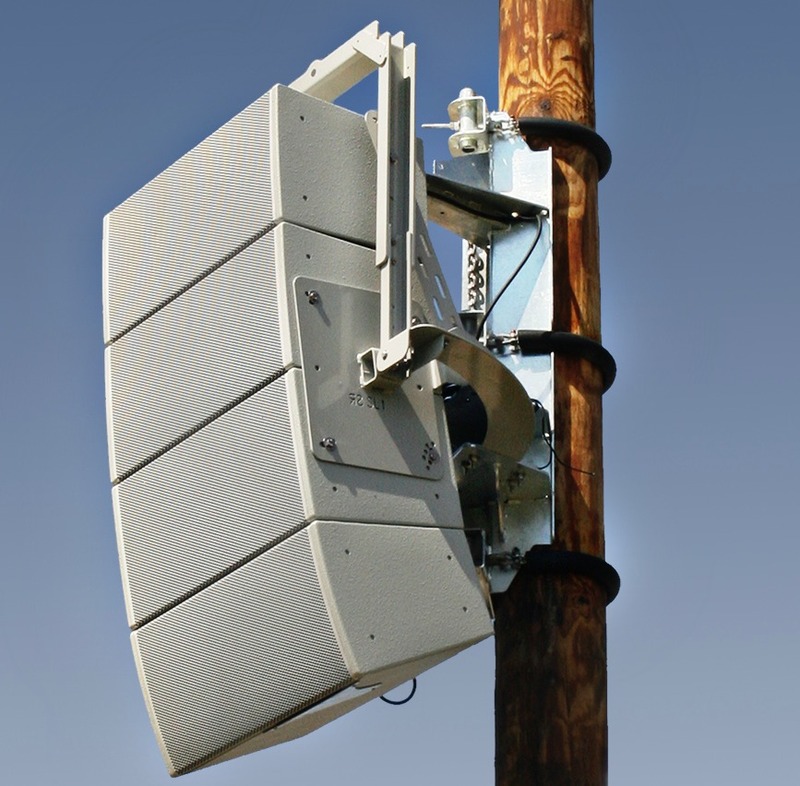 3G Productions, Inc will be installing four d&b audiotechnik line arrays consisting of 12 midhi frequency boxes – 6 V8’s and 6 V12’s; plus four V-SUB Subwoofers. Image | August 18, 2016 July 11, 2018 | Polar Focus, Inc.
Here’s an amazing line array trolley system being installed by Video Services, Inc. at the newly renovated Mankato Event Center in Mankato, MN. 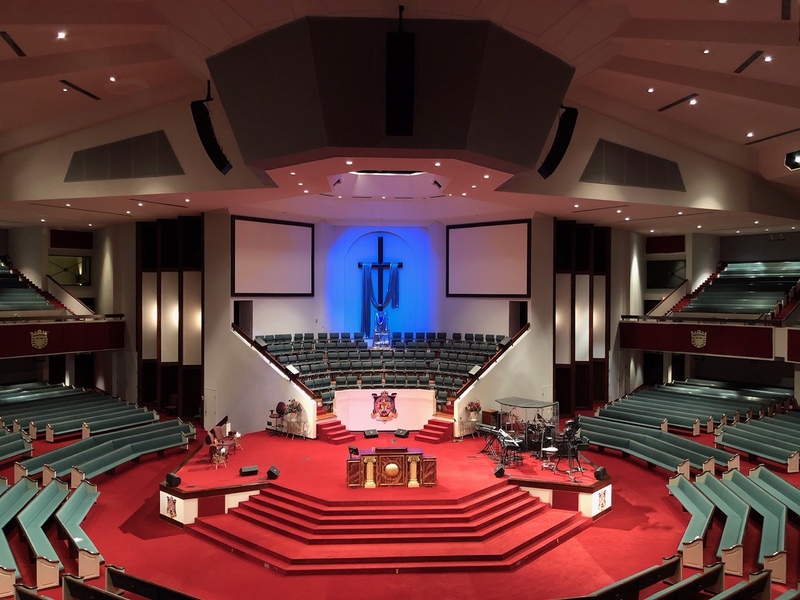 Designed by Peterson AV Consulting, Inc., this project consisted of two systems, a FOH distributed system with 10 Fulcrum Acoustic AH65’s; and two Martin Audio line array clusters consisting of 8 W8LC modules with two custom flying amp racks. The amp racks are standard rolling amp racks, which are each secured into a flying cage. 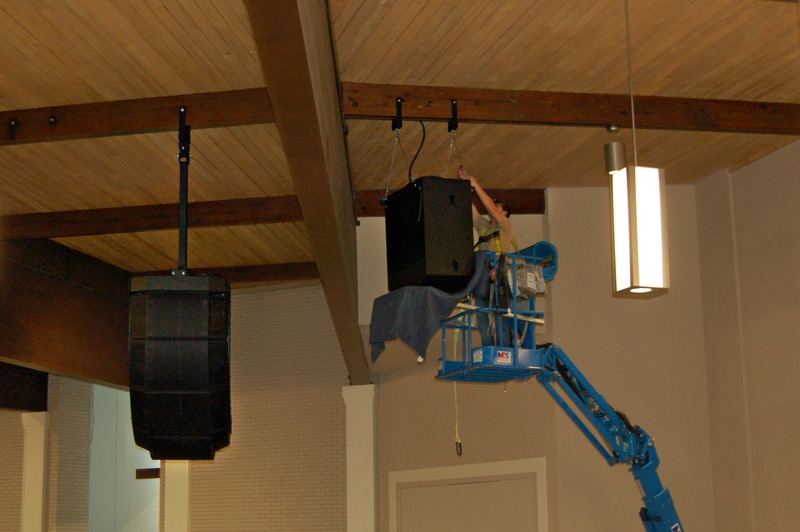 Each rack and cluster can be independently raised or lowered on its own hoist. Each amp rack and line array cluster travels front to back in the room on trolley beams. 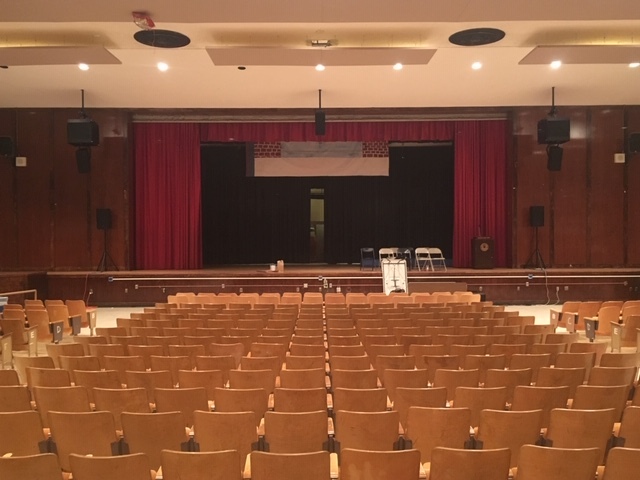 For stage extension productions, the clusters roll forward. To hide the clusters, they can be rolled on the trolley beams into tall closets on the back wall. 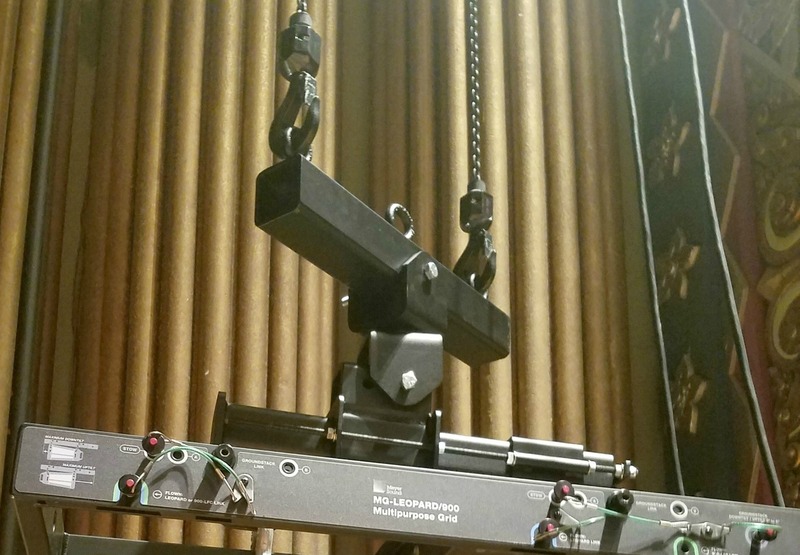 Polar Focus supplied the trolley rigging system, hoists, Motor Zbeams, flying rack cages, aiming bars for the main line arrays, all the rigging for the distributed FOH system, and finally PE stamped drawings for the entire design, stamped by a Minnesota Structural Engineer. 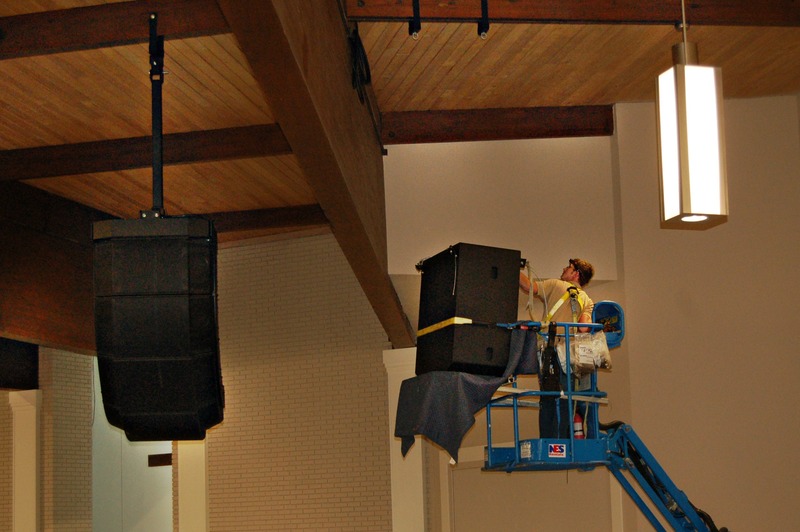 The renovated Event Center opens September 1st – we hope they enjoy their new sound system! We’re looking forward to more photos of this project as it is completed, so we’ll share them as they come in. 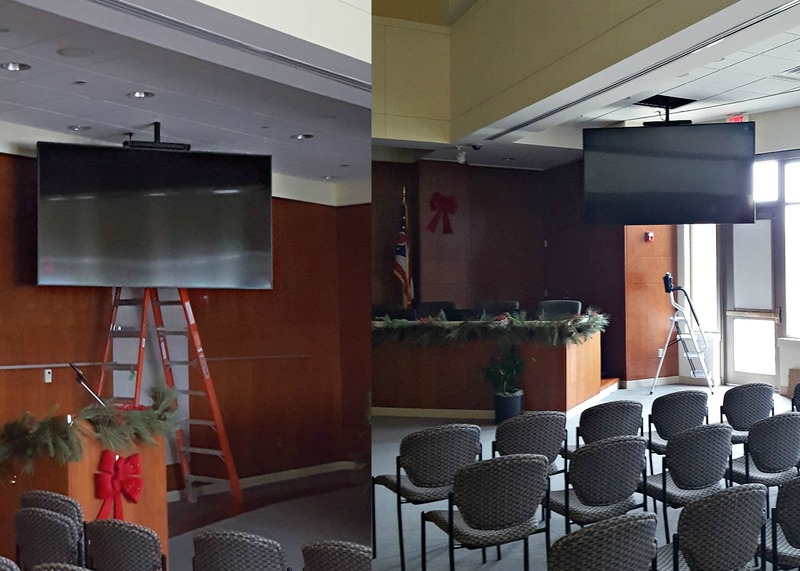 Excellent work, Dave Peterson and the crew at Video Services, Inc.! We also offer PE Stamped Drawings for our product scope for all 50 states. 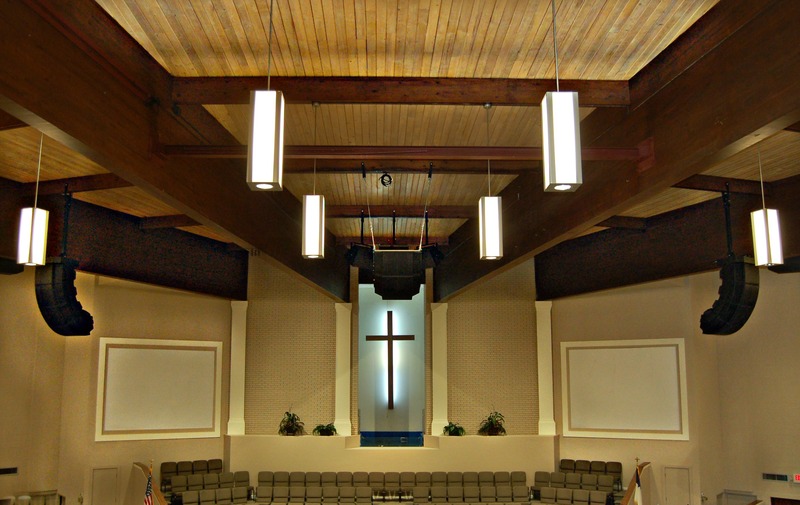 July 14, 2016 January 27, 2017 | Polar Focus, Inc.
For this project, Polar Focus supplied two PM2-10-Z Pole Mounts and our weatherized bracket for the JBL CBT 70J-1 and 70JE-1 Line Array Column. 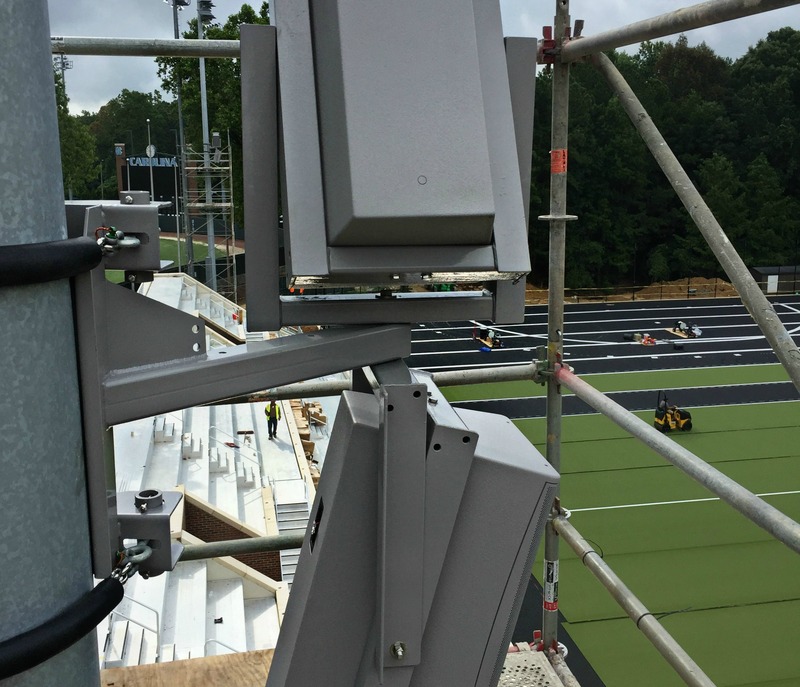 This was installed in April by Dustin Treml with Daktronics at the US Lacrosse Headquarters and Training Center in Sparks, Maryland. This system offers infinitely adjustable pan and tilt control and has been galvanized for weather resistance. Polar Focus PM2-10-Z is zinc plated for corrosion resistance. Custom powder coat colors may be specified as required for particular installations. Stay tuned for more Secret Products! If you don’t see what you need on our catalog, call us at (413) 586-4444 – we can design a custom product for your application.